LOS ANGELES - May 28, 2017 - PRLog -- "A passionate and original take on a Traditional American Food. Thats a good thing." said Los Angeles Magazine Food Critic Patric Kuh of the new BBQ RESCUES! Foundation (Inc). It was towards the end of a lively one hour telephone discussion about Barbecue with Chef Mick Brown, who appeared last Thursday (5/25) on the Cooking Channel's "Farmers Market Flip"(FMF) . They also talked about how Brown was named the first Grill Master Champion on Food Network's "Cutththroat Kitchen". 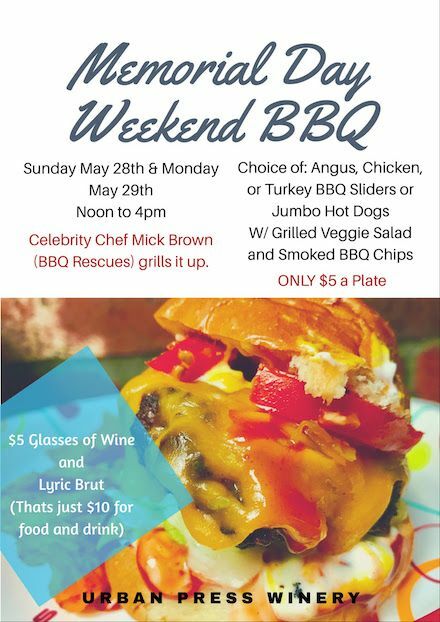 He is hosting a special Memorial Day Weekend BBQ Fundraiser at the Urban Press Winery in Burbank on Sunday May 28th and Monday May 29th from 12:00 Noon to 4:00pm (or until the BBQ Sells Out). Kuh is expected to attend, along with other notables like GreySave Board President Cathy Kibrust and Celebrity Chef Jason Fullilove- Brown's rival Competitor on the Episode of FMF, who has also appeared on "Beat Bobby Flay". Fullilove will be taking time from his busy schedule getting his highly acclaimed restaurant Barbara Jean ready for relaunch in West Hollywood. For his Salted Kits brand carried at Whole Foods, Fullilove is partnered with friends Chefs Eric Greenspan, Pace Webb and Simon Mujumdar (who happened to be the Judge on Brown's winning Episode of "Cutthroat Kitchen"). Guests will be astounded by close-up "Magic with Micheal Rangel" (of Magic Castle), who will be performing at the Urban Press Winery from 2:00pm to 4:00pm during Sunday's BBQ Fundraiser kickoff. The Wine-Inspired $5 Menu will include Grilled Angus, Chicken Breast, Turkey and Veggie BBQ Sliders, as well as Smoked Jumbo Angus Beef and Turkey Dogs. Truffle ($2) and Cheddar ($1) Cheeses can be added to any Sandwich. Gluten Free and Vegan Supporters can order the Grilled Italian Veggie Salad (or add any of the Meats for $2 Bucks), or nosh on Smoked BBQ Chips with HEROIC! Sriracha Sauce. The Urban Press Winery will also have a $5 Wine Glasses on Special. "We want to make Healthier Grilling FUN! ", according to BBQ RESCUES! (BBQR) Foundation Director, Chef Mick Brown. "And to broaden the way that people think of Barbecue. In 2017, BBQ it is no longer 'All About the Meat'." The BBQR Foundation encourages people to use creative and delicious ways to include Fresh Vegetables into their regular BBQ Cookouts, and to consider adding Vegan BBQ Entrees (gasp!) as options for Guests. Brown credits this style of cooking to the success of his top rated Los Angeles catering firm Tastee BQ Grilling Co., which has catered everywhere from a Pool Party at the Beatles Mansion to the Katie and Tom Engagement Party on the Season Finale episode of "Vanderpump Rules" (Bravo TV) in 2016. The event was filmed at Lisa Vanderpump and Ken Todd's Villa Rosa Estate in Beverly Hills. Brown claims to be the first (and last) Grill Master to ever cook at the famous Manor. The BBQR Foundation also plans to share recipes with other BBQ Caterers and Restaurants throughout the U.S., encouraging them to add Healthy Grilling options to their Menus. The new organization is already an active Member of The National Barbecue and Grilling Association (NBBQA). The Foundation has been endorsed by Michelle Mazzara, Minnesota TV News Personality and Owner of Luvafoodie.com and Los Angeles Magazine Food Critic Patric Kuh. They have also released an entry to the Tesla/Solar City's Project Loveday Contest- a unique DIY Solar BBQ Smoker video which they hope will go viral in the upcoming months. The Grill with Ernie The Smoking Frog may make an appearance at this weekend's event. Chef Mick Brown to host first California BBQ RESCUES! Foundation Fundraiser "Grilling With Wine", on Memorial Day Weekend at the Urban Press Winery in Burbank. Sunday May 28th & Monday May 29th from 12pm to 4pm (or until the BBQ sells out). The Urban Press Winery is located at 316 N San Fernando Rd. in Burbank,CA. 91502. Small and Larger Orders can request Pick-Up in advance at www.BBQRESCUES.org. No Telephone Orders, Please.